V21 unleashes a final blast of new features. Although this will be the final content update for Brutal Doom, Sergeant_MK_IV noted that v21 itself adds “mountains of improvements.” According to the changelog, this includes stun animations for zombies and imps, multiple improved fatalities, a “more accurate” headshot system, and better effects for dirt particles and Cyberdemon stomp attacks. The update also introduces changes from an earlier private Beta, foremost amongst which is the introduction of a new weapon—the flamethrower. You can see that in action below. Oh, and the update also includes new “Hell Knight and Baron of Hell crotch pain animation rotations.” I think I'm going to miss Brutal Doom's changelog notes most of all. It reads like Literature. Accompanying this raft of new features is a singificant performance boost. 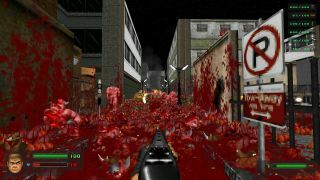 “Now late levels of Scythe 2 and Hell Revealed, which were previously considered unplayable with Brutal Doom, can run smoothly on any descent computer,” Sergeant_MK_IV points out. While future updates will focus almost entirely on bugs, there are still a few things left to add, primarily support for the later levels of Doom II and Ultimate Doom. But Sergreant_MK_IV states that these “won’t even require testing. You can download the Release Candidate version here. Last year’s open beta trailer for v21 is below, if you're unfamiliar with the most. If that's the case, prepare yourself.